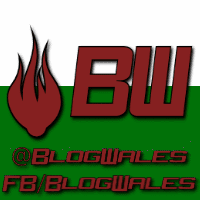 Labour's abstention on the Welfare bill keeps offering nuggets of hypocrisy all over the place, you needn't look very hard to find them and today we'll take a look at Llanelli's Labour MP Nia Griffith. 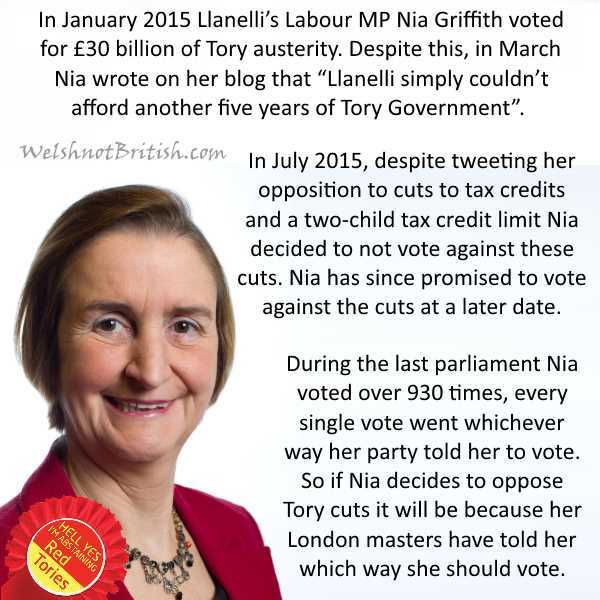 Nia Griffith voted for the Tories £30 billion worth of austerity cuts in January and then had the audacity in March to write on her blog that "Llanelli simply couldn't afford another five years of Tory Government". Unfortunately the people of Llanelli are rather fond of austerity so they voted for her once again, just as they have voted Labour in each general election for the past 93 years. Nia is not a rebel, in any sense of the word. If I had to compile a list of reasons why I detest Labour then quite high on the list would be the sheer audacity and contempt for which they have for the people that voted for them. And one such example of this contempt has been demonstrated quite brilliantly this week by Cardiff West's Labour MP Kevin Brennan. 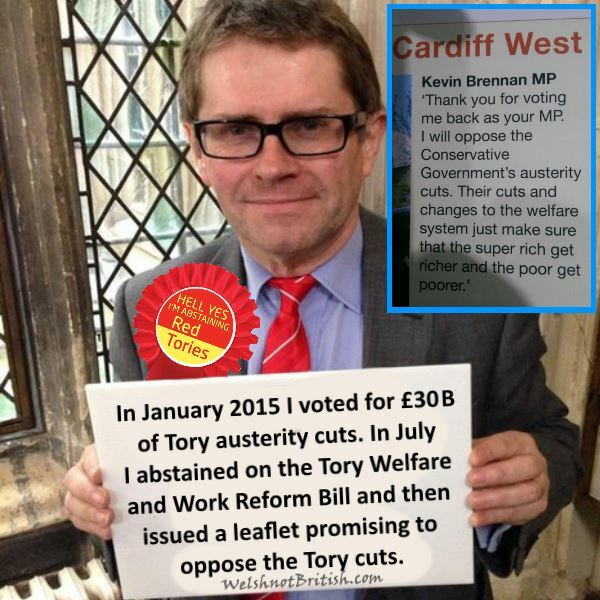 Kevin Brennan voted for £30 billion of Tory austerity cuts back in January. He was re-elected in May and was one of the gutless MPs who recently abstained on the Tories Welfare and Work Reform Bill. Repeat after me, abstaining is opposing. 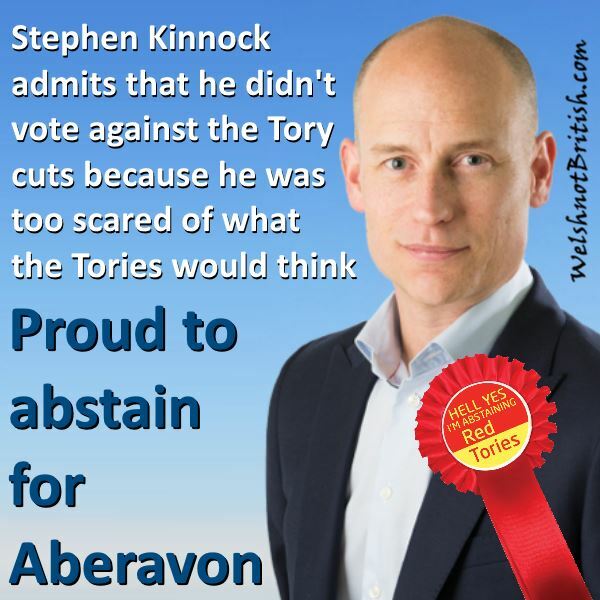 Regular readers might remember that I congratulated Stephen Kinnock on becoming Aberavon's next MP back in March 2014, well over a year before he was actually elected, such is the predictability of the voters in the Labour owned valleys. 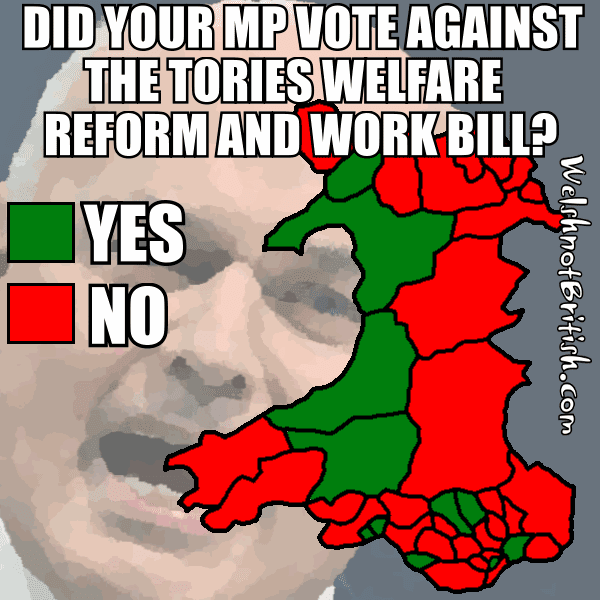 Did your MP vote against the Tories Welfare Reform and Work Bill? Barely a few days after my disappointment at not getting to colour in new constituencies on my last map, a new vote hits the headlines which saw 47* Labour MPs rebel against their party. Even more remarkable is that not only has this been covered by the EBC, it has also published a list of MPs from the opposition parties who turned up at their place of work in order to oppose the Tory bill. This kind of journalism from the EBC is virtually unheard of. There's a more in depth explanation of what the vote was about plus a full list of how each member voted (or didn't vote) at this site but here's a quick summary. Reduce the benefit cap in order to make large areas of England too expensive for poor people, freeze some pension and disability benefits, limit child benefit to the first two children and swapping some benefits for loans. 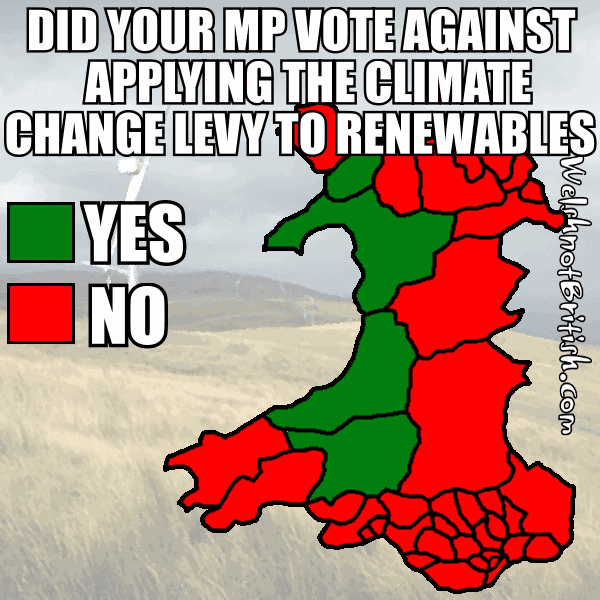 Did your MP vote against applying the Climate Change Levy to renewables? In the UK we have a 'Climate Change Levy' which is designed to tax energy used by businesses, it is meant to promote energy efficiency and reduce carbon emissions since the less energy you use the less tax you pay on it. Renewable energy was exempt from this levy, but a recent vote in parliament has seen this exemption lifted. This means it is now not beneficial for companies to switch to an energy supplier that uses mostly renewables. I was hoping that I'd get to colour in new constituencies, oh well.